If You Want to See a Whale: A quiet story in a perfect package. If You Want to See a Whale is a flawlessly designed book. The diminutive trim size, approximately 9×7, begs to be held; the enticingly serene cover prompts readers to curl up and escape into its pages. Peeling away the deliciously smooth coated matte cover reveals a rich blue cloth with a humpback whale in relief. Complementing the deep blue background, the book’s title is stamped on the spine in a lavish copper foil which perfectly matches the endpapers. The interior paper has substantial weight and its milky white canvas spotlights the art. Absent of punctuation and in a font reminiscent of a typewriter the exclusively lower-case text is judiciously set apart from the art, accentuating the story’s quiet, contemplative feel. This is not a story to be rushed through. This is a story about waiting, about being quiet, about being still. Readers, like the book’s main character, are rewarded for these virtues. Fogliano’s compact, lyrical prose is reminiscent of Ruth Krauss and Karla Kuskin but her style is decidedly her own. Her stories are thoughtful, poetic and sublimely profound. Like Fogliano and Stead’s other collaboration, And Then it’s Spring, If You Want to See a Whale offers tranquility—a welcome and necessary port in a sea of noise. Stead’s art— composed of whisper thin lines, fervently detailed and ever so delicate—invites the reader to study each spread. Color, at once saturated and transparent, is used sparingly. Stead’s incredibly involved process of creating the art can be viewed here. A young ginger haired boy and his loyal basset hound are determined to see a whale, but seeing a whale is no simple task. It requires an ocean, and a window for watching, and a chair for sitting, and patience, for it may take a very long time. A whale watcher cannot get too comfortable, for fear of falling asleep. A whale watcher cannot allow himself to be distracted by passing ships, or puffy clouds. A whale watcher must simply watch, and wait. And as with all important things in life, focus and determination pay off in the end. A Home for Bird by Philip C. Stead: A touching story of friendship, kindness and determination. Philip C. Stead is the author of several books, some of which he illustrated himself and some that are illustrated by his wife, Erin E. Stead. Their book, A Sick Day for Amos McGee, won the 2011 Caldecott Medal, which is awarded annually to the artist of the most distinguished American picture book for children. Philip C. Stead, the writer, possesses the rare ability to convey a world of thoughts with a minimal amount of text. His stories are perfectly paced and wholly satisfying. Philip C. Stead, the illustrator, creates images that invoke warm, pleasing feelings. 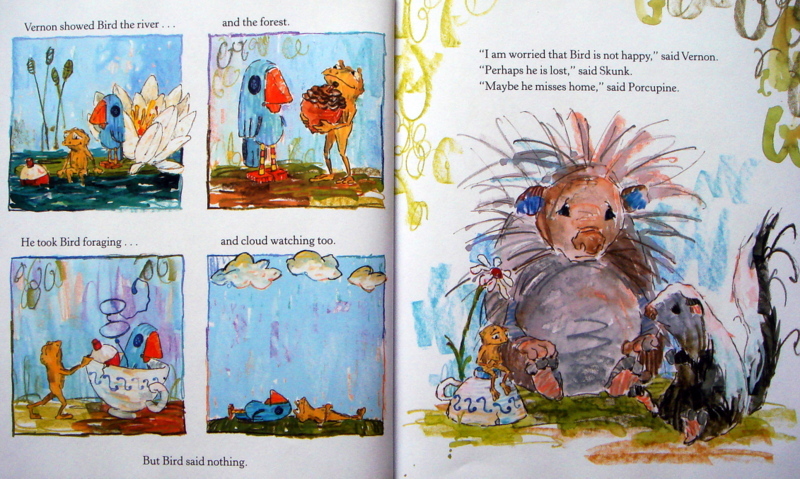 His art in A Home for Bird was created with crayons and gouache (an opaque watercolor paint) producing a whimsical, child-like feel. Each illustration contains its own radiant world of genial animals surrounded by curious items such as yo-yo’s, old cans, bottle caps and teacups. The opening illustration of A Home for Bird features an old pick-up truck; “Careful Moving Company” is stenciled on its door. A small cuckoo bird has sprung from its clock and tumbled off the back of the overstuffed truck bed into the wide, unknown world. 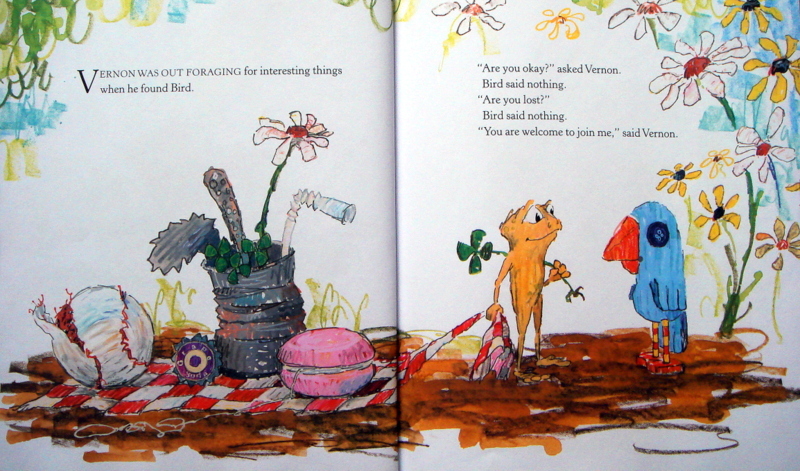 In the next spread, Vernon, a curious frog who loves to collect interesting items, discovers the newly homeless bird. Concerned, Vernon addresses the stoic bird but receives no response. The kind-hearted frog introduces Bird to Skunk and Porcupine but still, Bird says nothing. Vernon’s friends wonder if their silent new friend is lost, or missing his home. Ever helpful, Vernon prepares for a journey to help his new friend find his home. The unlikely pair visits multiple dwellings: a discarded birdcage, a mailbox surrounded by flamingos, a nest full of eggs. 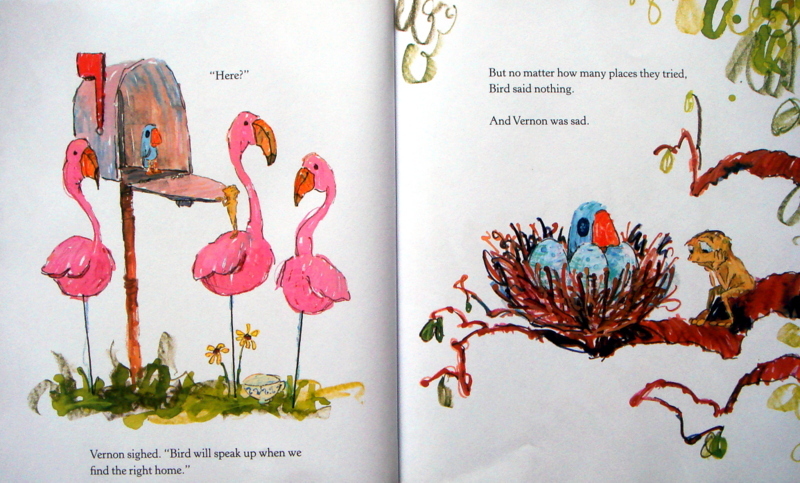 Bird continues to be silent; Vernon is hopeful that Bird will speak up when they find the right home. After much travel and no luck, Vernon is sad for his new friend and the intrepid travelers are growing tired. Vernon decides to ask for help. 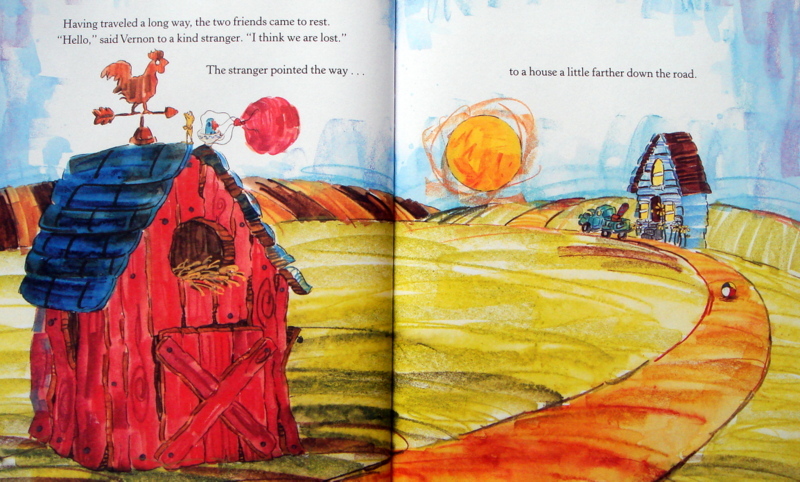 The helpful stranger directs Vernon and Bird to a farmhouse. 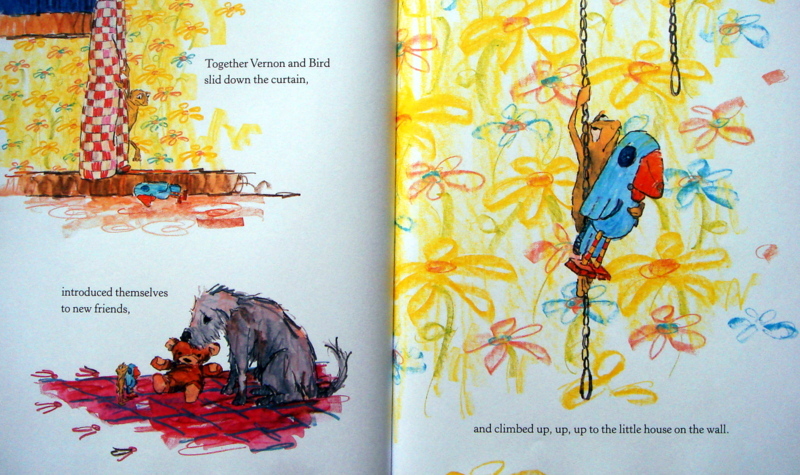 Inside the cozy house, Vernon introduces himself and his mute friend to some new friends. 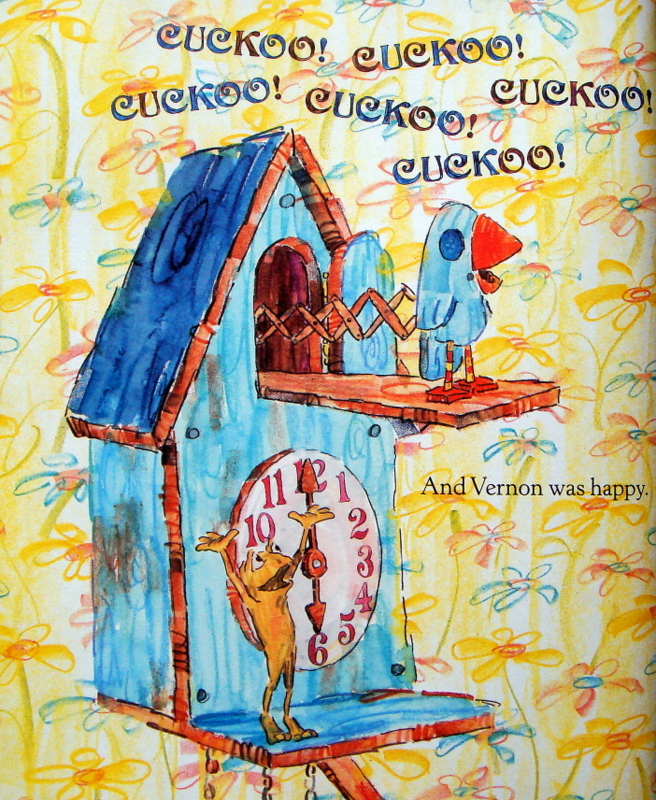 Spotting a lovely little house hanging on the wall, Vernon makes the climb up with Bird in his arms and deposits him safely behind a small door; Vernon goes to sleep behind another door—sporting a clock-face—directly beneath Bird. Vernon falls asleep to the rhythmic sounds of a clock. In honor of the forthcoming Caldecott and Newbery announcement (on January 28th, 2013) Philip and Erin Stead, author and illustrator of A Sick Day for Amos McGee (the 2011 Caldecott winner) and Bear Has a Story to Tell, announce their Phildecott and Steadbery Awards, aka their “Best of 2012” list. Includes bonus thoughts on the importance of bookstores and the perseverance of the printed book. The twenty-first century has had a rocky start for lovers of bookstores and real, paper books. The advent of e-bookery coupled with Wall Street’s unfortunate shenanigans has created an environment in which many stores have had to close their doors. Here in Ann Arbor we lost Shaman Drum, our downtown indie store that had peddled books to students and townies alike for more than three decades. Next was Borders, an Ann Arbor institution that began as a small indie shop on State Street. Long before her career as a bookmaker Erin worked at the downtown Borders. She tended the children’s section. It’s strange now to walk by its empty shell.